It’s a field trip with a difference in this week’s Sherlock, as Mark Gatiss takes on perhaps the best known Holmes story of them all: The Hound of the Baskervilles. Our heroes decamp to the bleakness of Dartmoor to deal with an apparently supernatural hound. Is it somehow linked to a nearby top-secret research facility named Baskerville? And can Holmes continue to function at his deductive best if he can’t fully rely on the evidence of his own senses? If I wanted poetry I’d read John’s emails to his girlfriend. 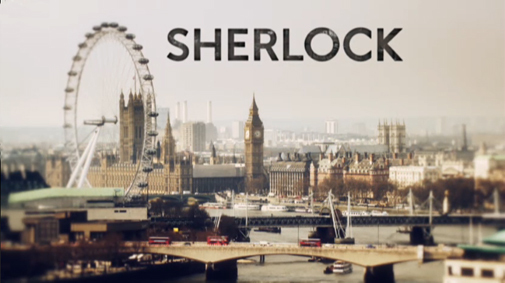 Sherlock and John are engaged by Henry Knight (Russell Tovey), who has returned to Dartmoor to face his personal demons surrounding the killing of his father by a gigantic hound when he was still a child. On arriving at Dartmoor the pair sneak into the Baskerville chemical and biological research facility. Here they encounter two researchers: the stern Dr Stapleton (Amelia Bullmore) and the affable Dr Frankland (Clive Mantle). The latter recognises Sherlock and professes to be a fan of Watson’s blog. Once you rule out the impossible whatever remains, however improbable, must be true. Using Mycroft’s influence, Sherlock gains 24-hour unlimited access to Baskerville to allow him to test out a theory he has. He sends John out to search the labs but he becomes trapped in one and ends up cowering inside a cage while he sees and hears the hound prowling outside. Sherlock eventually arrives to retrieve him. Digging deep into his own mind, he pieces together the disparate strands to recall a long-terminated Project HOUND, which was based in Liberty, Indiana. After deducing the ranking officer’s password and hacking into the system, Sherlock discovers the truth behind HOUND: the project name is an acronym of the initials of the principal scientists’ surnames, it involved the development of an anti-personnel chemical weapon which produced conditioned terror and paranoia in anyone exposed to it, and a young Dr Frankland was part of the team. Dr Mortimer phones John to tell him that a delusional Henry just tried to shoot her, and they race to Dewer’s Hollow just in time to stop him from shooting himself, as instructed by Frankland. The hound appears – actually an ordinary dog made to appear that way by the effect of the hallucinogenic gas which is contained in the fog and triggered by a chemical minefield rigged in the Hollow. John and Lestrade shoot the dog. Frankland, now revealed as Henry’s father’s killer, is unmasked (literally) by Sherlock, who momentarily sees Moriarty’s face instead of Frankland’s. The scientist attempts to escape but steps into a real minefield and is blown up. The task facing Gatiss in reworking the original Baskervilles story – the third of Conan Doyle’s four full-length Holmes novels – was an immense one. Not only is it probably the best-known Holmes tale, but it is one which is distinctly different in tone to most of the others. It takes place almost entirely away from the comfortable familiarity of London and 221b Baker Street, and it is as much a gothic horror tale as it is a whodunnit. In addition, in its original form it is a yarn even more firmly rooted in the Victorian era than the standard Holmes story, and one which does not easily translate into a 21st century setting. More than that, the original Baskervilles story is, in my opinion, actually one of the weaker tales in the canon. Holmes is absent from the action for the early part of it (although he is actually present in disguise in the background). His deductive prowess takes a back-seat to emphasising the possible supernatural nature of the hound. And the case itself is padded out by the inclusion of a number of supporting characters who add little to the central plot other than obfuscating the truth and adding to the cast of suspects. To his credit, Gatiss’ script sheds all of the unnecessary baggage and drives straight to the heart of the story: an innocent man who is being manipulated into his own death. Indeed, while retaining certain key elements of the original story – some of the original characters are retained but rewritten (the butler Barrymore becomes Major Barrymore, Sir Henry becomes Henry Knight, Frankland himself was originally a minor character) – he makes several significant changes which, on the whole, update the story in an improved way. Most significantly of all, he confounds readers of the original by changing the identity of the killer: here it is Frankland, in the book it is Stapleton (a man, not a woman). Converting Baskerville from a gothic mansion into an ethically dubious research facility provides a relevant modern twist. There’s no cloak-and-dagger with Holmes being out of the picture first – here he is straight into the thick of it, and we get an interesting examination of his psyche and his absolute reliance on his enhanced senses. And, most pleasingly, Gatiss pulls a masterful trick by making the Dartmoor fog central to the plot. In the book, it adds to the foreboding and terrifying atmosphere. Here it appears to be little more than window dressing at first, but turns out to be the delivery mechanism by which Frankland manipulates Henry. It’s a simple twist, but a clever and satisfying one. The stripped-down central plot affords space to gently build the looming sense of doom throughout the episode. Sometimes less is more, and the lack of multiple plot elements and action is a departure from the norm for Sherlock, but an important one in what is effectively a psychological horror tale. For fans of Holmes’ deductive methods, there are two wonderful setpieces: the first up front as Sherlock deconstructs the events of Henry’s journey from Devon to London, the second a whirlwind deduction of the unemployed fisherman and his widowed mother which is delivered at such breakneck speed that Holmes can’t even be bothered to wait for Watson to insert the questions – he simply asks and answers himself. The continuing internal references. The deerstalker photo makes a second appearance. Frankland mentions a case with an aluminium crutch which he read on John’s blog – it is actually on the blog if you want to read it (and the hit counter is still stuck on 1,895, as mentioned in A Scandal in Belgravia). And of course Holmes utters his famous impossible/improbable line, which is actually from The Sign of the Four and not Baskervilles, trivia fans. Benedict Cumberbatch and Martin Freeman are at their very best in this episode, with Freeman in particular conveying with simple expressions both his deep loyalty to and equally deep frustration with Sherlock, often within the same scene. Lestrade finally gets a first name! In the books, he is only ever referred to as ‘Inspector G Lestrade’. Here we learn he is called Greg. Typically, Sherlock has never bothered to know his name. The final reveal where John realises it was Sherlock who trapped him – turning him literally (well, almost) into a laboratory rat, just so he could test out his hallucinogenic theory. Paul McGuigan’s direction is suitably unsettling, making clever use of lighting effects, camera angles and movements to convey the characters’ discomfort at events. The coda with Mycroft ordering the release of Moriarty from a stripped-down cell in which he has written ‘Sherlock’ on the walls over and over again. What the hell is going on here? And do we really have to wait until next week to find out? A bit too much random plot-filler, some of which was genuinely amusing (Sherlock’s initial rant about needing nicotine or a case, or preferably both) but much of which wasn’t (see my next point). Was it really necessary for John to stumble upon the local dogging venue to plant the very remote seed that HOUND might be an acronym in Sherlock’s mind? I understand why Gatiss wrote this little side-step: it was a nod to the original, where the flashing of a light across the moors was integral to one of the major sub-plots. Even so, it felt tacked on. Sherlock’s ‘mind palace’: funny. The Minority Report hand-waving thing as he manipulated his thoughts: funny. Jumping from there straight to a recessed memory of Project HOUND, Liberty and Indiana: whoa, major leap of exposition there. It wasn’t so much deduction as dredging, and it was mighty convenient that Sherlock somehow knew about a top secret US project which had been shut down for over 20 years. Mycroft really ought to lock up his files more carefully, eh? Deducing that Major Barrymore’s password was ‘Maggie’. In addition to this being basically an informed but still lucky guess, is it really plausible that a high-ranking military officer in charge of a top-secret facility would use such a simple password? With lax security measures like that, is it any wonder we’re so bad at keeping secrets? Still, at least he didn’t use ‘password’ as his password, I suppose. The explanation of the whole HOUND acronym felt very forced. I suspect this was a real Marmite episode. 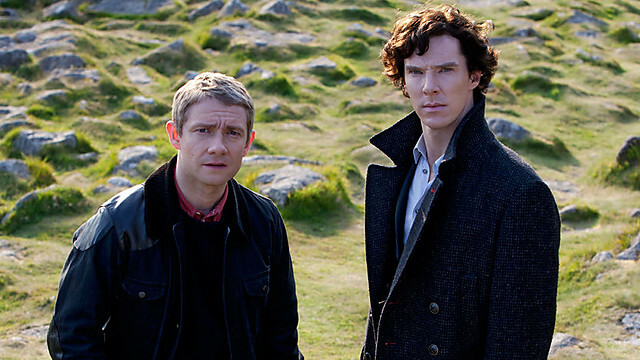 Viewers who were expecting the pace and action of a typical Sherlock episode will have been sorely disappointed. Those looking for an interesting new take on a familiar and well-worn story will have been happy to see past the various flaws in the plot and revel in all that is good about Gatiss’ version. I fall into the latter camp – this wasn’t as great as A Scandal in Belgravia, but even merely very good Sherlock is still a cut above the best that the majority of other shows can ever aspire to. Next week: The Reichenbach Fall (aka The Final Problem). Not a place that those Health and Safety folks would recommend, I suspect. Posted in Entertainment, Sherlock, TV & film and tagged Arthur Conan Doyle, BBC, Benedict Cumberbatch, Clive Mantle, Dr Frankland, H.O.U.N.D., Hound of the Baskervilles, Indiana, Inspector Lestrade, John Watson, liberty, Mark Gatiss, Martin Freeman, Mrs Hudson, Mycroft Holmes, Rupert Graves, Sherlock, Sherlock Holmes, Steven Moffat, The Hounds of Baskerville, Una Stubbs, Watson. Bookmark the permalink. I enjoyed it… but did feel somewhat let down by it..
won’t stop me watching though! Thanks for your kind comment, John. While I don’t think this was as good as A Scandal in Belgravia, it was still gripping stuff, if paced in a somewhat more leisurely way than we have become accustomed to. But then I think that’s necessary in order to gradually crank up the fear quotient. Anything too rapid would have just fallen into the shock-horror category. ‘Scandal in Belgravia’ was excellent – a fine re-working of the story, amusing, well-paced & clever. Wonderful TV. Well done Steven Moffat. Unfortunately, the pattern that was obvious from series 1 is re-asserting itself: episode 2, written by Mark Gatiss, was extraordinarily weaker: confusing, plot threads dropped, unconvincing and failing to use Cumberbatch’s Sherlock to his full potential. Very creaky and disappointing all round. Will episode 3 recover the TV laurels so confidently won by the Moffat script? Will I bother watching it? I think it was difficult to get the balance right between discarding extraneous plot threads and giving a few nods to the original. Personally, I thought Gatiss got more right than wrong, although as I’ve said the ‘flashing light’ thread was a bit time-consuming and pointless. Equally, I don’t really rate the original Baskervilles story that highly – it’s less a traditional Holmes tale than Conan Doyle’s attempt at gothic horror, with Sherlock himself absent for a large chunk of the story. Sherlock isn’t as central to this story as usual, but Cumberbatch does get to take the character in a unique direction by having him face up to fear and uncertainty. And, of course, in the climax of the episode, when he unmasks Frankland he sees the face of Moriarty – the one person he truly fears. Cumberbatch deals with these scenes admirably, I think. Freeman is superb in his understated way too. I do agree that the second episode of last season was by far the weakest of the three, although in the case of s1ep2, The Blind Banker was written by Stephen Thompson rather than Gatiss. liberty indiana is a small one horse town. not much going on there… so who picked liberty? i am from connersville and was shocked. I live in the uk atm so .. well shocker for me. Wouldn’t Liberty’s remoteness therefore make it a good location to house a top secret chemical weapons project? Los Alamos was chosen for the Manhattan Project in WWII largely because it was in the middle of nowhere and therefore the ideal site for a project of such a sensitive (and dangerous) nature. To be honest, I think the selection of Liberty, In was as much due to the fact it added to the puzzle for viewers by throwing out a whole load of connotations which were all red herrings. Artistic licence, as it were. Yes, I agree. The selection of Liberty as a secret lab is ludicrous. A bunch of funny talking smart guys wearing matching t-shirts with HOUNDS on them would draw a lot of attention. It would not take a Sherlock to figure out that some thing was up. The locals may not be able to figure out the truth, but rumors would be wilder than the research. I am from Liberty and it is not a one horse town. In fact there are laws against keeping horses in town. It is a NO horse town. By the way, I love the show. Great summary which I believe I enjoyed more than the actual episode. I will however watch next week’s finale. You’re correct, it is great television, pity there aren’t more programmes of this quality. I’m a bit concerned that next week’s finale cannot possibly live up to expectations. Clearly it will draw on The Final Problem, but from the early trailers I have seen I think it will have a very different twist to it. No matter what, it will be appointment TV in our household! Thanks for the comment, Sarah. At the very least, you would expect someone to be required to include a combination of both numbers and letters in their password to avoid the very thing that Sherlock achieves. It was only a minor quibble, though – like you, it didn’t spoil my enjoyment of the episode. I have no idea about what happens with passwords in top secret labs or indeed anywhere other than where I work, but is it not the case that in most jobs, public sector or otherwise, people are given a computer-generated password to start with then told to change it to something they will remember? I would have expected a combination of letters and numbers too, though. The password thing was a stretch but I absolutely adored the episode – loved it more than Belgravia although the more comments I read, the more I seem to be on my own in that view. Ah well, we’ll see how next week goes! Hey CJ. That’s exactly what I would expect to happen with passwords – or at least it’s what’s happened with every job I’ve ever been in. You get given a password, are told to change it, and then you have to keep changing it on a regular basis. So at my company, for instance, I think the policy is that your password must be at least 8 characters and contain at least 1 number, and you are then required to change it at least every 90 days (or something like that). For a supposedly top secret facility, I’m guessing every user would have at least this as a minimum requirement – and almost certainly something a bit more complex – and then any sensitive databases such as the one Sherlock went into would have an additional level of security. It’s a small quibble though, and ultimately you have to give the writers a bit of dramatic licence to stop the story from bogging down. It’s like the Doctor and his sonic, or the transporter in Star Trek – such narrative devices serve the purpose of moving the story from A to B as quickly as possible so we can concentrate on the good stuff. I’m impressed. This is probably the most thorough review I’ve ever read. I agree with your comment about it being a Marmite episode – I was definitely more interested what Mark Gatiss would make of an iconic story, rather than be overly critical of it as a thing in itself. I enjoyed every minute. It doesn’t really matter that A Scandal in Belgravia was technically better. I expect Moffat and Gatiss will pull out all the stops for The Reichenbach Fall. We have a new Holmes and Watson in Benedict Cumberbatch and Martin Freeman – they’ve completely eclipsed the previous incumbents. The first time I watched Baskerville, I wasn’t that impressed, I thought it was a rather disjointed story. On rewatching it, I am far more impressed, not as good as Belgravia or ReicheInbach but still very good. It would be Liberty, IN not Liberty, In (state abbreviations are capitalized in the US). Did they have to do the bloody sandbags. Baskerville has been going for a very long time, so sandbags would not be used except in an emergency such as a leak from one of the tanks/pipes but then the wall of sandbags was open at either end (or was this just a visual gag that I missed). I believe the corporal would not have saluted John Watson because he was not in uniform. Vermillion Indiana did in fact have a largescale chemical weapons base. Actually enough to kill an entire country, D Day’s amphibious landings were planned in part at a relatively innocuous naval training ground in Indianapolis that hadn’t been largely used since the time when sloops were important, and the second largest military building in the world The Army Finance Center is in Indiana as well. It isn’t that its remote. It’s that who would bloody look in middle America its unimaginably boring. Thanks for the info – interesting stuff! The state abbreviation (frustratingly) jumped out at me, as well. In the ’80s, they would have used the abbreviation “Ind.” for Indiana, especially for a government project (which didn’t standardize to two-letter state abbreviations until ’87, according to the wiki). Capital I, lowercase n has never been an abbreviation for that state, afaik. Not sure how to even make that mistake, except by not even checking it at all, and just assuming you already know. For a critical plot point… Tsk. Sometimes writers knowingly allow relatively small errors to slide so as not to spoil the story – the various Star Trek series sometimes sacrificed some small but fundamental laws of physics in the interests of story-telling – but as you say it’s probably more likely that Gatiss made an incorrect assumption and the error was never picked up, and particularly because it was such a key plot point. This was my least favourite episode of season two, though I still loved it! I was just kind of disappointed that the Irene/Sherlock storyline didn’t carry on. I was looking forward to it so much I was practically screaming at the end of the first episode. I think it would have been over-egging it to pick up the Irene Adler story here – remember this season is really all about Holmes and Moriarty. Hopefully we will see it rekindled next year, although to be honest I’m also OK with them leaving it as is, just as it was in the original books. What was the significance of U M Q R A? Either I missed something or there is a big loose end here. Can someone set me straight? There was no significance. It was merely a red herring, a random sequence of flashes occurring as a result of John stumbling on the local dogging site and putting two unrelated events together. Of course, there’s a thin thread of ‘dogging’ playing into the whole ‘hounds’ theme, although I’m unsure whether that was really meant to be deliberate or not.